Cheesy sounding title aside, this is something a lot of folks who are on Twitter would want to know. In the morning, I posted a few tweets on this topic. I felt there’s a bit more to unpack here so following it up with a blog post. Before we jump on the tips and tricks, let me share what all I look at before deciding to follow someone or not. While I might have a different approach, I believe most other users of Twitter would be following a similar approach. Step 1: Visit person’s profile and give a cursory glance. Since Twitter profile (unlike Facebook) has limited fields, it makes the job easy for me to get a quick sense. A sneak preview of user profile in Tweetdeck. 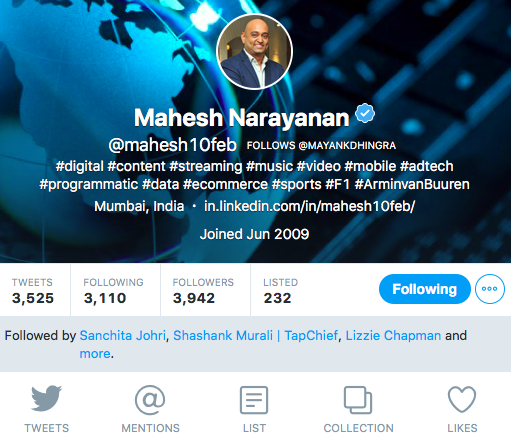 A sneak preview of user profile in Twitter’s iOS App. If this quick glance is satisfactory, I check out the person’s Tweets. To find out more about what kind of tweets does this person make, are they just tweets, RTs or replies to other people. This is a bit of a subjective one. What might be interesting for one might be boring to another (say politics). Tweet regularly and try to keep the tweets interesting (a mix of your thoughts, good stuff you found on internet etc). 5-10 tweets a day is good. Interact with other people and their tweets often (Talk to people, RT and Like good tweets you find). 5-10 replies and interactions a day is good. Getting more people to click the follow button. Background Image – Not that important really but don’t screw it up by putting a lame background image. Tried to keep this post short and useful at the same time. If you try this, do let me know how it works out. 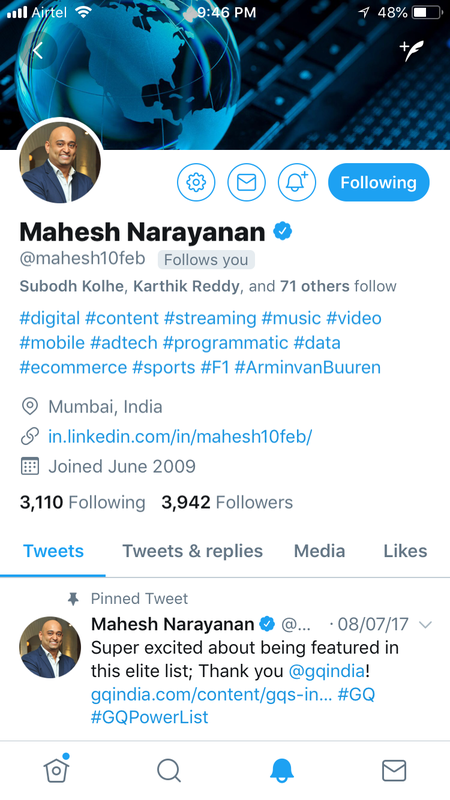 This entry was posted in microblogging, twitter and tagged followers, following, twitter, user-profile on September 6, 2018 by mayank.